Our popular seven piece collection for intermediate to advanced players. Complete with CD (full demo and backing tracks). 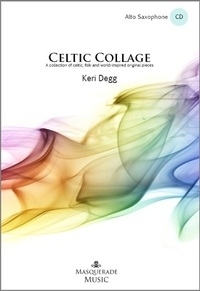 Written by UK composer Keri Degg in 2012, Celtic Collage is an exciting collection of seven original pieces for Alto saxophone and CD with pull out Piano accompaniment part included (also available in flute edition and Clarinet / Tenor sax edition to follow soon). The collection is aimed at grade 6+ level players. The CD contains both full demonstration, and accompaniment tracks. From laments to lively jigs, there's plenty of choice, and as the composer is herself an experienced woodwind teacher, the pieces are written in a thoughtful and sensible way. Piece VII (also known as Celtic VII) is currently on the Trinity college syllabus (Grade 5). Here are two audio samples from the collection (the following audio samples are taken from the flute edition, again, saxophone audio to follow soon) ; 'Celtic V' , a complete audio track, and also Celtic Collage medley containing all 7 excerpts from the collection. Click play (triangle button) on the Soundcloud player below or click these links if the Soundcloud players are not visible on your device; 'Celtic V' audio and Medley of excerpts from Celtic collage. Overseas customers (or indeed those just liking a bargain!) may like to consider our PDF / MP3 email delivery option which is usually delivered to your inbox within 24 hours of order (see our PDF email delivery saxophone category). Flute, and Clarinet/Bb Saxophone editions are also available.